Iguazu Falls are located inside Iguazu National Park shared by Argentina and Brazil, which has been inscribed in the UNESCO World Human and Natural Heritage list in 1984. The area is embraced by a huge and lush subtropical rainforest which contains thousands of cascades, small and big rivers witch allow multiple activities, over 2,000 species of vascular plants and is home to the typical wildlife of the region: tapirs, giant anteaters, howler monkeys, ocelots, jaguars and caimans. Iguazu means in guarani “big water” and there’s a serious reason, there are about 275 falls up to 70m high. The powerful noise of the falling water is truly awesome. The most amazing site is Garganta del Diablo (Devil’s Throat), the biggest fall, on the Argentine side. Iguazu area enjoys of Sub-Tropical Humid weather. Parana and Iguazu rivers, as well as the Itaipu Dam, influence in the humidity of the destination. 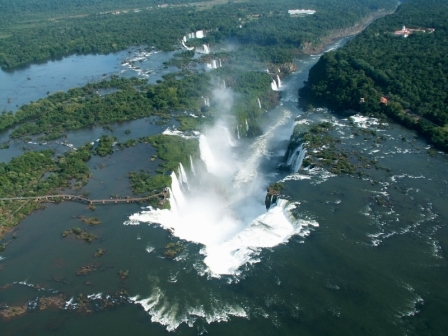 The hottest months in Iguazu Falls are October through April. Winter months are a bit cooler, especially at night. During the entire year, you can enjoy a warm atmosphere. The Iguazu Falls can be accessed by air to any of the Argentine or Brazilian airports -Puerto Iguazu (Arg) or Foz do Iguacu (Brz)- from Buenos Aires (1:45h) or Rio de Janeiro (2h), respectively. By bus from Buenos Aires (16h), Rio de Janeiro (18h), Campo Grande (16h), Posadas (4h) or Salta (24h). This tour takes you to the Iguazú National Park on the Argentine side of the border, allowing you to explore several spectacular vantage points from which to observe the thundering waterfalls. Two of the highlights are lookout points over Dos Hermanas (Two Sisters) Falls, and La Garganta de Diablo (The Devil’s Throat). To get to the highest fall, you take an ecological train that skirts the river. There are many trails that you will get to explore which showcase the colorful and diverse flora and fauna of the region. The tour begins in the back of a military truck which takes you down the rugged jungle path to the docks at the river. The ‘open’ back truck allows a great vantage point to see the many parakeets, parrots, macaws, toucans, and many other birds, lizards, monkeys and myriad of butterflies, 85 species of orchids, bromeliads, and guembes that call this jungle area their home. After about a 45 minute ride through the forest, you will arrive at their docks on the river, where you will board river boats that will take you breathtakingly close to the falls before arriving at another dock further upstream. From here, there is an optional free trip to the nearby island of San Martin and the chance to explore it.